I love social media: twitter, facebook, and blogging. It’s amazing the things that can happen out of social media. In the past few months I have really gotten into twitter. I like it even more than facebook, which if you know how much I love facebook you would be shocked! This commercial pretty much sums up my life right now. Well Angie you just made my night! Within a week I had this in my possession! This is what social media and community management should be within a company. Making customers happy without them even asking. I would LOVE to do this as my job, hopefully one day I will. 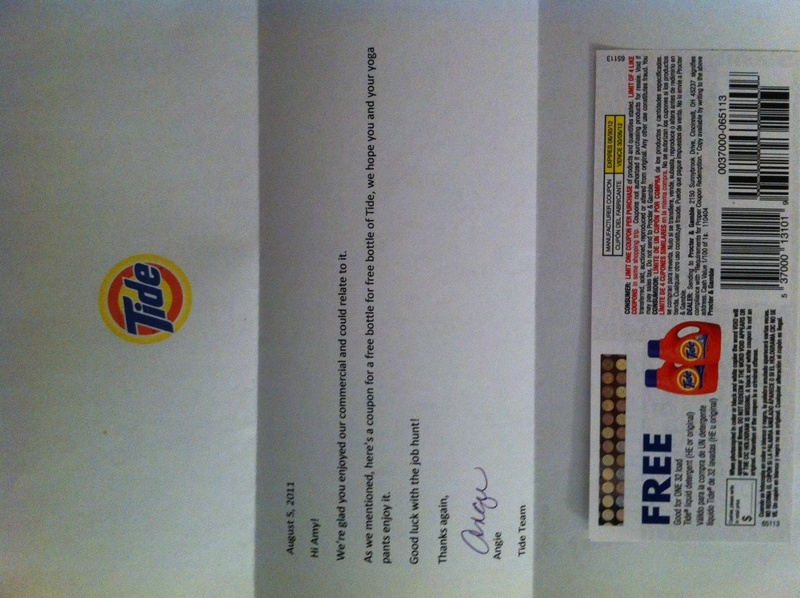 It’s crazy how a couple tweets ended up with free tide, but I truly appreciate it! Thanks Tide! I’ve always used Tide and this gesture will definitely keep me as a loyal customer for years to come. disclaimer: Tide did not ask me to blog about this or even knows I have a blog. I wrote this blog because I was truly impressed with their community management/social media team and wanted to share. Has a company ever sent you anything via social media just because? I didn’t get anything out this, except for a laugh but I think I will always buy Tide from now on just because of this! 🙂 They have a sense of humor and appreciate their consumers!! Go Tide! Thanks for sharing Amy!